Last night I joined 3 other experienced GAPSters on the panel at the Clark County, Washington Weston A. Price Foundation (WAPF) meeting. Since folks asked, I thought I’d give everyone a little recap with added information and a booklist! There was also a Green Pastures Fermented Cod Liver Oil tasting bar and potluck. Yum! If you were at the meeting and would like to add the stuff I forgot to the comments, provide pictures, or post the recipes to the treats you shared, I’d love that! Teri of Grain Free Foodies blog (Grain Free Foodies on facebook). She started GAPS after going gluten, dairy, and soy free and introducing probiotics in 2009 to help her children with colic, speech, and behavior issues. She focuses on the fact that GAPS food is the highest quality… it’s what top chefs use! We can enjoy food and enjoy life on the GAPS diet, not feel deprived. Judith Calhoun, RN, NTP, Holistic Nutritional Therapist, who has been working with GAPS patients for 6 months. She practices as a nurse at the Rising Health Wellness Center. Carolyn Miller of Killing Cancer Kindly. Her son was given 2 months to live due to his brain tumor. By using a modified version of GAPS (increased fat and reduced carbs) they stopped her son’s tumor’s growth and he’s still alive and doing well 2.5 years later! She is also starting up a business in providing GAPS foods to others. I need the details on that! Mama (that’s me!) My whole family has been on the GAPS diet since February 2011. You can read all about our experiences on this blog! I offer one on one coaching and hands-on help as well as workshops for your friends, family, or community group. How are GAPS & WAPF Connected? We started out with brief introductions and a little explanation of how the GAPS diet ties in with WAPF dietary guidelines. The simplest way to put it is that GAPS (the Gut and Psychology/Physiology Syndrome) Diet is the WAPF way of eating without the starches! We use all the same traditional food selection and preparation guidelines, but we stay away from grains, legumes, and starchy vegetables. The GAPS diet also has an introduction which starts you off with only the most nutrient dense, easily absorbed foods and slowly introduces the rest of the foods you can eat on the diet. The goal of this diet is to “heal and seal” the gut lining and to create a healthy balance of flora in the body. Additionally, the GAPS protocol includes supporting your elimination pathways so that as you experience “die off” of candida (or other bacterial) overgrowth or chelation of heavy metals, you can eliminate them successfully. The GAPS diet builds on the work of Dr. Sidney Haas, who realized in the 1920’s that celiac children could go on to live healthy lives if they eliminated starches (disaccharide and polysaccharide sugars) from their diet. His diet (known as the Banana Diet) was later modified and popularized by Elaine Gottschal’s excellent book, Breaking the Vicious Cycle. She used the Specific Carbohydrate Diet (SCD) to cure her autistic son daughter, who had ulcerative colitis. Dr. Natasha Campbell-McBride, who developed the GAPS protocol and cured her son’s autism, takes the SCD and brings the principles of WAPF to it. Other diets you may have heard of that have a lot in common or overlap with GAPS and SCD are Paleo, Primal, The Body Ecology Diet, Atkins, anti-inflammatory, autoimmune protocol, Spectrum Balance Protocol Diet, gluten-free, and some nutritional plans for diabetics. Dairy kefir – Check out this video on how to make dairy kefir. You can get grains from other WAPF members, or buy them on-line from my friend, Julie, at Cultures for Health. You can use them with coconut milk, too, but you’ll need to return them to milk from time to time. The milk kefir grains will not be 100% dairy free even if you use them with coconut milk so if you have life-threatening dairy allergies, beware! We use raw milk. Yogurt – Here is how my family makes GAPS/SCD legal yogurt. There are lots of different starters you can use we use Nancy’s yogurt, but you can buy other types at Cultures for Health. Water kefir – Here is how we do water kefir. You can also get grains from WAPF members, or buy them from Cultures for Health. Kombucha – Kombucha can be made with tea (caffienated) or rooibos tea (decaf!). You can get a scoby from WAPF friends or Cultures for Health. Therapeutic strength probiotic pills – BioKult and GutPro are both recommended by Dr. Natasha. Our family mostly uses probiotic foods, but we also take GutPro Probiotic Powder when we remember. Different probiotics have different strains in them. Some may not make you feel any difference, some may cause more die off or other symptoms. Work with your health care practitioner to choose the right one for you. When introducing therapeutic strength probiotics, you may want to start with much lower than recommended doses and work up to the recommended dose. Ferments can be mildly alcoholic so recovering alcoholics who are very sensitive may want to stay away from kefir and kombucha. What if you are worried about probiotics making other health problems worse? A guest asked about high stomach acid – he said he’d been told to avoid probiotics because of it. We didn’t know whether it was important to avoid probiotics due to high stomach acid. The stomach, especially if acid is high, is not populated by the strains of bacteria we eat in probiotic foods. The consensus among the panel was to first consult a health care practitioner. If they gave the ok, then probiotic foods should be introduced very slowly – just start with a very small amount each day, and increase it if you are feeling well. If die off symptoms occur, then stay at that level or back off a bit before increasing the amounts again. GERD isn’t actually caused by high stomach acid. It’s now believed to be caused by a build up of pressure which causes reflux. Bacterial overgrowth and low stomach acid combined with a starchy diet can be huge factors in GERD. I like this article from Chris Kresser explaining it. Probiotics and the GAPS diet often resolve GERD for many people. Carolyn mentioned how because of her son’s condition, he needs to eat more than half of his calories in fat and one way to do that is by eating spoonfuls of coconut oil and cooking with it. One guest asked about why coconut oil makes her conk out. Teri mentioned that coconut oil has anti-microbial properties, and the sleepiness might be a die-off reaction. Carolyn mentioned that eating fat is a very good way to stay full. My experience has been the same… except for during candida die-off, when the little critters were screaming “FEED ME SUGAR.” In general, a high fat diet does give more feelings of satiety. Carolyn also mentioned that before going on GAPS, just eating WAPF, she had health issue get better. But going on GAPS resulted in her losing 40 (unwanted) lbs. The GAPS diet is naturally gluten-free, since all grains are excluded. However, some people are very sensitive to gluten. If you have celiac disease, even using old kitchen utensils that were once used with gluten can make you sick. If you are having an autoimmune reaction to gluten and don’t take the steps to really get rid of gluten cross-contamination, going on GAPS may not be good enough! Finally, once you decide you want to do GAPS, it is a good idea to get screened for celiac disease. Once you are gluten-free, getting an accurate test for celiac disease is nearly impossible. I’m “allergic to everything” according to tests I had done. Some of these foods are allowed on GAPS. Will I be able to eat them? IgE – these are the “true allergies.” They are the ones that can cause anaphylactic shock and histamine reactions. The symptoms can include mucous production, itchy eyes, nose, throat, and mouth, sinus pressure, swelling, hives, rashes, and even the inability to breath. When you think IgE, think “Hay Fever!” People with IgE reactions often find that they have a cumulative effect. For example, our son always had terrible seasonal allergies, no matter what we did. But when we cut corn out of his diet, which we’d never noticed him reacting to, all his chronic inflammation decreased so much that he is now able to go without meds and enjoy the outdoors! Eating corn had his body at the limit all the time, so his reactions were severe. While he still gets some hay fever, he is much better at his worst than he used to be at his best. Some people have healed from even severe IgE allergies. However, if you want to try a food to which you have had a life-threatening reaction, it is important to do that experiment in a medical facility under the direct supervision of a qualified allergy specialist. IgG – This is one kind of intolerance rather than a true allergy. When you have a “leaky gut” (yes, that’s a real, scientific, thing that means just what it says), partially or improperly digested food molecules make it past your gut lining. The body then reacts to these molecules, creating IgG antibodies. This is why so many people score high for IgG antibodies to all their favorite foods. Rotation diets are often prescribed – where you eat foods for a few days, then switch to eating different foods for a few days, and eventually switch back. Before the reaction builds on itself and gets too severe, you switch to new foods. But your damaged gut is still a problem, so then you start reacting to the new foods, and have to switch again. Healing the gut with the GAPS protocol will often resolve these kinds of food intolerances. I tested high IgG for eggs. Should I try to reintroduce them? The GAPS protocol does allow eggs, which should be pastured and soy and corn free. The eggs tested in the lab are typically conventionally raised eggs. It is possible that the reason you reacted to them was because of their feed (I have this issue). Judith pointed out that many people who react to chicken eggs are able to eat duck eggs because the protein in them is different. In the GAPS intro, you will introduce eggs by first testing the egg yolk on your skin. Rub a bit on the inside of your wrist at night and let it dry. If the area is at all inflamed in the morning, do not try the egg yolk, and try the test again in a couple weeks. I’ve noticed this method of testing works best for people who typically have skin reactions to things. Not reacting is no guarantee you will be comfortable eating the food. If you tolerate the egg yolk, you can add it to your broth and stir it into your soup. If that is well tolerated, you can then try egg whites, using the same pattern, and then eating broth poached eggs. How to know when to move through the GAPS diet stages or if it is ok to introduce a food I used to be sensitive to? You can use the method described above for testing sensitivity to any foods. If the food is dry, mix it with a bit of water before putting it on your wrist. Knowing when to move through the stages is very individual and takes a lot of listening to your body. In the book, Dr. Natasha talks about looking for regular bowel movements and decreased gas and bloating. Basically you should be feeling good before introducing new foods if possible. But sometimes you feel bad because of needing something you are not getting in the earliest stages of intro. Pay attention to your cravings, signs of die-off, mental state, gut health, neurological symptoms, and more! This is a much broader and individual topic than we could cover here or I can write about now, but I am happy to help you learn to listen to your body and help you work with your doctor to determine what your body needs in one-on-one coaching sessions. When you introduce new probiotic foods and cut out starchy foods, the candida and other bacterial overgrowths in your body will start to die off. When that happens, they release toxins into your body, causing symptoms. These are individual, but some common ones are eczema flare-ups, swollen glands, ear ache, sore throat, and fatigue. You do not want to have an extreme die-off all at once, because it can be too intense for your system. This is why it is good to introduce new probiotic foods slowly over time, slowly increasing the amounts. Nursing mothers and others who have concerns about extreme die-off symptoms can be helped by “backing into” the GAPS diet. In this case, you add the new core foods of the diet first (stock, probiotic foods, fermented cod liver oil), and then start taking out the foods that are not allowed on the full diet, then take out the foods that are not allowed on stage 6 of intro, and go all the way back to intro stage one in this fashion. That allows your body to take its time adjusting. SIBO is Small Intestine Bacterial Overgrowth. In this condition, the peristalsis that flushes bacteria that normally live in the large intestine out of the small intestine has stopped working. Then the bacteria form colonies in the small intestine, where they do not belong. This causes symptoms such as constipation, diarrhea, bloating, pain, bad breath, and more. There is a simple breath test for the condition which is available with your doctor’s orders through NCNM in Portland. You can learn loads about SIBO on Dr. Allison Siebecker’s site, and read more in the book A New IBS Solution One of the recommended diets for SIBO is the GAPS diet. The SCD and the Elemental diet are also options. Targeted antibiotics (often Rifaximin in high doses), herbal treatments, and Migrating Motor Complex stimulating drugs round out the treatment options for SIBO. Even with SIBO, the consensus seems to be that probiotics and probiotic foods are still beneficial in helping keep the overgrowths in check. People with SIBO often experience recurrences when introducing fruits on the GAPS diet. Extreme moderation is often necessary, and people with SIBO need to look at the low-sugar diet as a life-style rather than a temporary protocol, since there is no known way to turn back on the peristalsis that would allow the small intestine to control the colonization it experiences. What about teeth turning grey and translucent on GAPS? We do not know the cause of this, but have heard of a couple people whose teeth changed appearance for the worse. One woman on the GAPS Help Yahoo Group discovered a combination between a probiotic she was taking and iron was discolering her teeth. Search the archives of GAPS Help and there are numerous dental health discussions. Often, people find that their teeth actually become less translucent and stronger on GAPS. We wonder if you could be experiencing a deficiency of some kind. What to do if you have no time? Pick one thing to add in and get used to that before adding in something else. The easiest probiotic drink is water kefir, and the easiest way to do broth is the perpetual stock method. Then you can ladle out the stock to use in cooking almost anywhere you would normally use water. How important is it to eat organic meat? It costs so much! Eating real food sourced from farmers with high standards is more expensive. It’s important to prioritize. We put meat at the top of the list of things that we want organic and pastured. Then we look at the vegetables and fruits and prioritize which ones to buy organic based on what poisons are typically used. We have been able to find great food in the area that is not certified organic, but which meets our quality standards. The farmers just haven’t done the paperwork, or may be growing in a transitional field. Buying farm direct or through local buying clubs is a great way to save money. But if you still really can’t afford the highest quality food, do the best with what you have. Eating your chicken stock from an industrial chicken is still better than not eating stock at all for most people. Many of these books do not pertain directly to GAPS, but they can be great resources for the GAPS diet. Just be aware that foods not allowed on the GAPS diet or the stage of the diet that you are on are included in the other books. Gut and Psychology Syndrome – This book talks specifically about the mental health connection between the gut and the brain, and also outlines the GAPS diet and protocol. Dr. Natasha will soon be coming out with another book, the Gut and Physiology Syndrome, which will explain more about the other physical symptoms many people with GAPS experience. If you are thinking about going on the GAPS diet, this book is critical! Put Your Heart in Your Mouth – Another book by Dr. Natasha, this one addresses the fear many people have when starting this kind of diet that all that fat and meat will give you heart disease. It is a quicker read with similar dietary guidelines but is no substitute for the GAPS book! Breaking the Vicious Cycle – The Specific Carbohydrate Book. It is a much easier and quicker read than the GAPS book and will give you a good understanding on the importance of cutting out starches and introducing probiotics. Primal Body, Primal Mind – Nora Gedgaudas writes beautifully and is brilliant. Her book covers an amazing amount of ground I can not begin to describe here. Suffice to say, you must read it. The Art of Fermentation – Sandor Katz’s new book – this one is like a college course text book! I haven’t made it through it yet, but it promises to be amazing. The Primal Blueprint – Mark Sisson of Mark’s Daily Apple outlines the basics of the Primal diet with a focus on weight loss and overall fitness. An easier read than Nora’s book, with more of a practical application focus. The Body Ecology Diet – Donna Gates independently came to many of the same principles about the importance of probiotic foods. She has a slightly different list of approved foods, and adds more information about combining foods. Nourishing Traditions – Sally Fallon’s classic on traditional cooking! It’s a must-have reference in the WAPF kitchen. This is a recipe book but I put it in the Theory section because we use it more as a reference. Nutrition and Physical Degeneration – This book describes Dr. Weston A. Price’s observations in detail, complete with pictures! Internal Bliss Cookbook – All the recipes in this book are GAPS Legal. The Grain Free Foodies have some recipes included in it, btw! 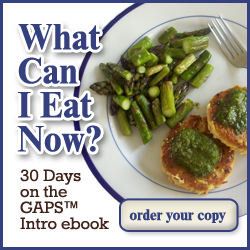 What Can I Eat Now: 30 Days on the GAPS Intro eBook – This eBook by Cara Faus of Health Home Happy is a 30 day guide to doing the GAPS intro. She helps you get prepared and figure out how to move between the stages, and provides a whole month of easy, GAPS legal recipes you’ll enjoy long after the Intro is over. The GAPS Guide – This easy book lays out a baby-step approach to doing the GAPS diet. The Complete Idiot’s Guide to Fermenting Foods – Wardeh Harmon of GNOWFGLINS just put out this book. I’ve only had a chance to flip through it (book review coming soon), but I’ve used her recipes in the past with success and the book is very easy to read and understand. There are sections involving grains, but you can take what you need and leave the rest! Everyday Paleo – Lots of pictures and delicious meal ideas, which, for the most part, fit in with the GAPS way of eating. Paleo Comfort Foods – Lots of pictures and delicious meal ideas, which, for the most part, fit in with the GAPS way of eating. This book is more beautiful and higher print quality than Everyday Paleo. Eat Like a Dinosaur – From Paleo Parents, this paleo cookbook is great for getting kids involved in the kitchen. Again, some modifications will be needed to the recipes, but most will work for GAPS. There is an added focus on being gluten-free (Paleo is inherently gluten-free) in this book. What a great write up of last night’s meeting, Mama. Thanks for putting it all into an easily digestible form. I have so appreciated your blog as I’ve taken off on this GAPS journey. Tremendously helpful! Thanks, AliceGray. It was really nice to meet you last night! I’ll add the results of the fermented cod liver oil tasting…Peppermint and Cinnamon were the clear winners. Liquorice and Ginger were either loved or hated. Someone loved the ginger? REALLY? I normally love ginger anything but the ginger FCLO tastes so bitter to me. I wish I had tried the Liquorice – I got busy talking with people and forgot to! ps – if anyone wants to buy our bottle of ginger fclo they can have it!